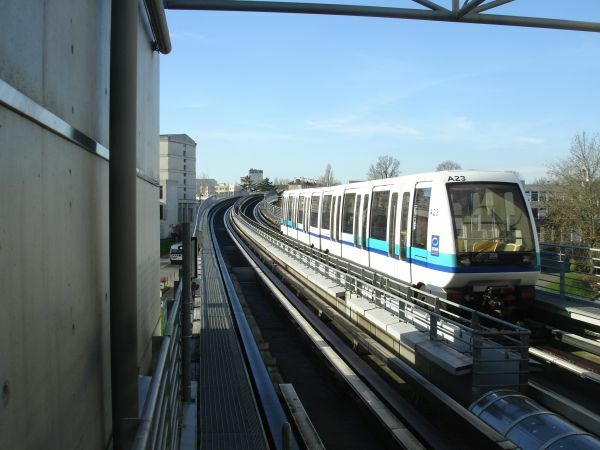 CDGVAL is a totally automated metro system connecting the various terminals of Paris' CDG airport. It's a free of charge system with two lines. The first line has five stations and the second line three. Total length of the system is 3,5 km. The whole system is designed and built by Siemens and it is called their VAL product (Véhicule Automatique Léger). It's a lightweight metro on rubber tyres with two coach trains. Picture from CDG VAL line one 5.4.2013 by Ilkka Siissalo. 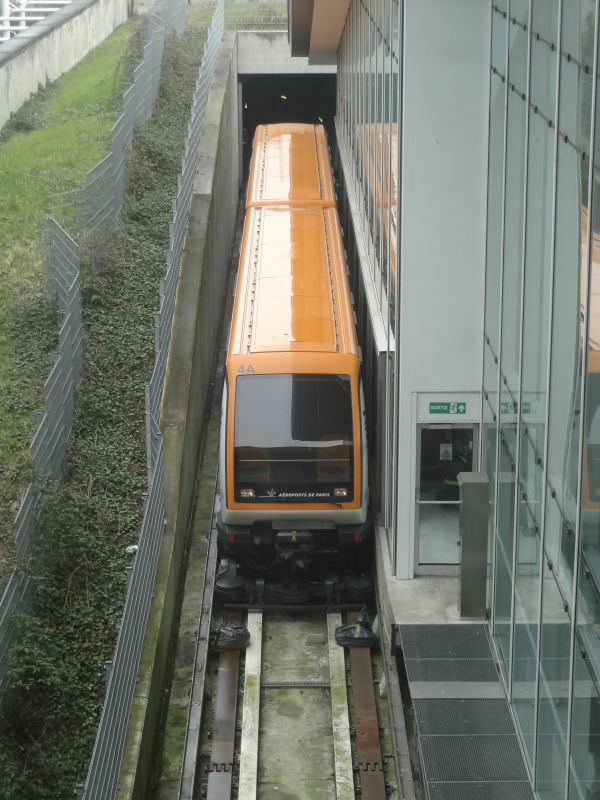 A CDGVAL train seen from above. Paris metro train 6059 is an example of the so called rubber tyre metros. It has large bogies with both train style metal wheels as well as rubber tyres like buses have. The rubber tyres take contact on large flat metal rails and they carry most of the weight of the train. As with any regular metro trains, there is still an extra side rail which carries the current to the train. These bogies are really huge and complex. This train no. 6059 is the very last one of the series MP59B. 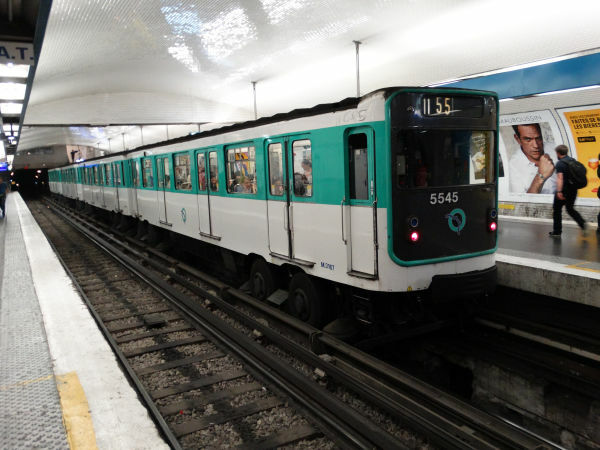 These trains are from the years 1963-64 and they are of the second generation of rubber tyre metros in Paris (the first generation being the MP55 trains). These MP59 trains were delivered in four batches A to D and this one is from the second batch B. The last batch D was delivered only in 1973-74. Picture from the Arts et Metiers station 9.6.2018 by Ilkka Siissalo. This Paris metro train no.5545 is a similar class MP59 train like the one pictured above, but it is from the very first batch MP59A of these trains. In the class name MP59 the number 59 states the model year when the basic design was made. Picture from Chatelet station 8.6.2018 by Ilkka Siissalo. A Paris metro class MF67 train approaching a station. 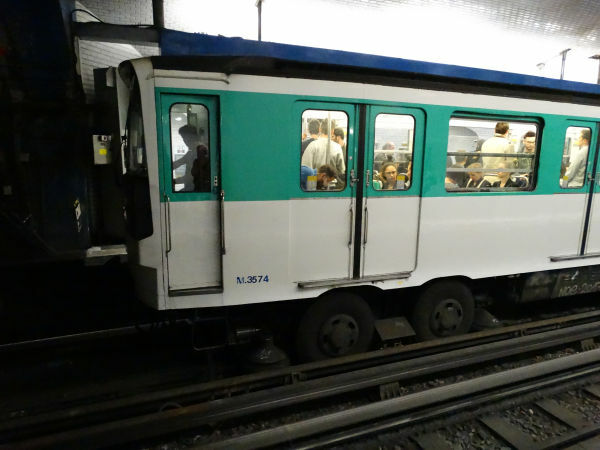 Originally the plan was to convert the entire metro system quickly to rubber tyre trains, but it was too slow and the rubber tyre trains were too expensive to run, so finally it had to be accepted that parts of the metro system should be run on rubber tyres and parts on normal trains´ steel wheels on steel tracks. This is a steel on steel model - as the name says, from the year 1967. It's a train manufactured by Brisonnay et Lotz 1967-1975. They are used in 3 coach sets on the short line 3bis and in 5 coach sets on lines elsewhere. These trains were refurbished 1995-98. Over 360 coaches of this type are still in use in 2018, typically on lines 3, 3bis, 10 and 12 as in the case here. Picture from line 12 at Saint Lazaire stateion 5.6.2018 by Ilkka Siissalo. Side view of a class MP73 metro. They are fairly similar to the older MP59 or MF67 trains. Only the front of the train is different on the outside, but inside the chairs and doors are a bit more modern. 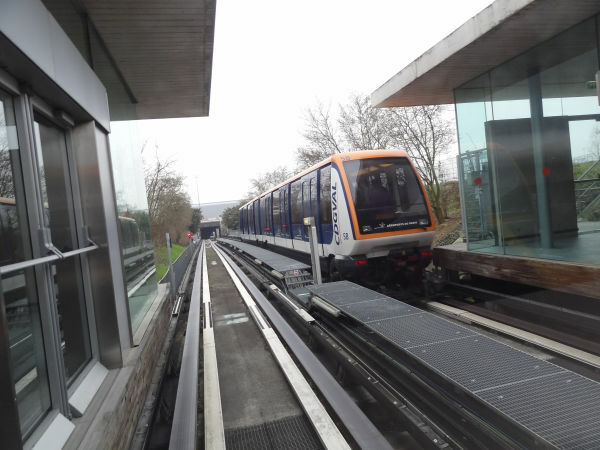 These are more "outdoor proof" than the previous rubber tyre trains and can better operate on lines with longer outdoor segments. Picture from Place d´Italie station 5.6.2018 by Ilkka Siissalo. 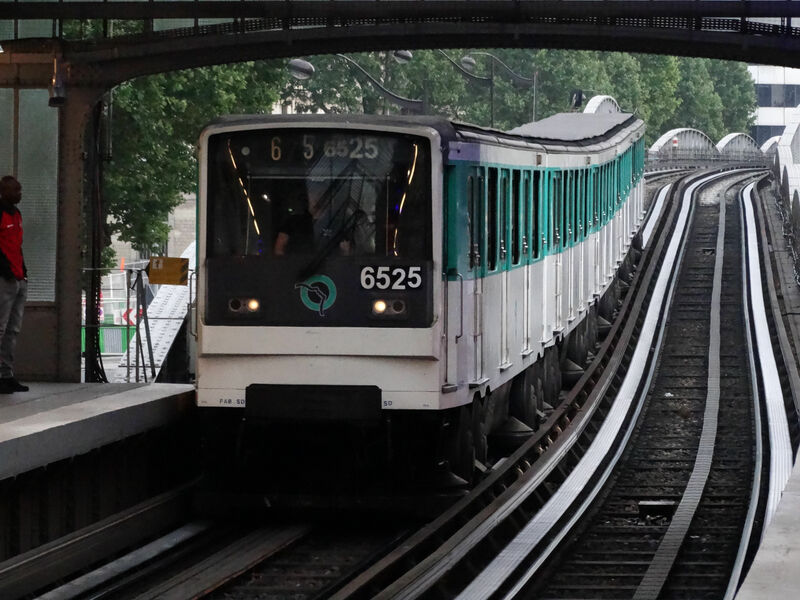 A class MP73 rubber type metro approaching the Quai de la Gare station close to the train station of Austerlitz. The class MP73 is a rubber tyre variant built since 1974 by what then was the company GEC Alsthom. These trains were constructed based on the successful MF67 model. 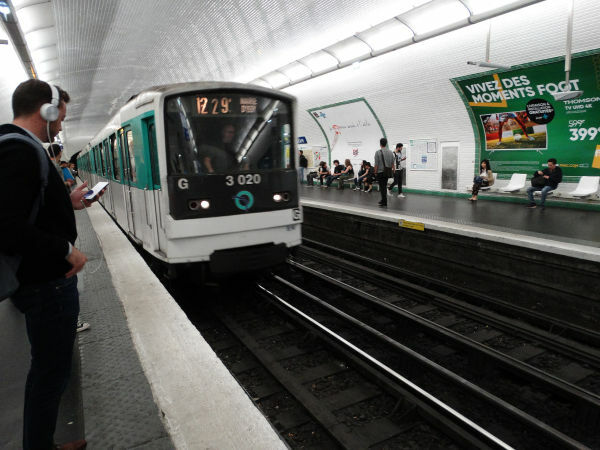 They are mainly serving on line 6 but can also be seen on line 11. Line 6 has long open air sections and it was thought to be a good idea to use these rubber tyre trains there to cause less noise than traditional steel on steel metros would. Picture from Quai de la Gare station 5.6.2018 by Ilkka Siissalo. 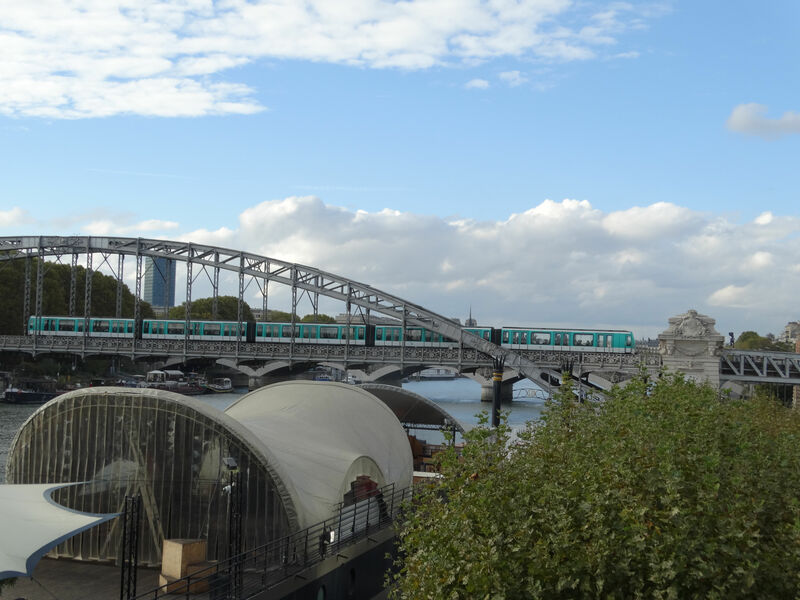 Another class MP73 rubber tyre metro train approaching the Quai de la Gare metro station after having just crossed over the river Seine on a bridge. This picture shows also clearly the track system of the rubber tyre metros. They have large flat iron rails that the rubber tyres are resting on, but on their side, they also have traditional train rails and train wheels which actually steer the trains. The bogies are really complex. This is a class MF77 metro train of the Paris metro. This type is a steel wheels on steel rails type traditional metro train designed for faster speeds on longer suburban lines. The first MF77 train entered service in September 1978. 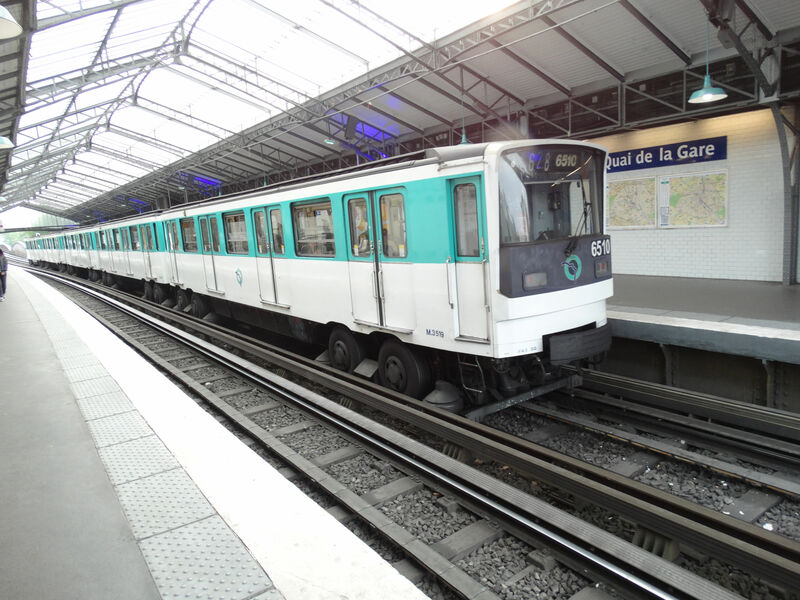 These trains were made by SFB and Alsthom and the last ones of the main series were delivered in 1883, although there was also a second series built in 1985-86. It is a fairly modern train with thyristor chopper technology. Picture from the Strasbourg - St. Denis station 27.1.2008 by Sanna Siissalo. 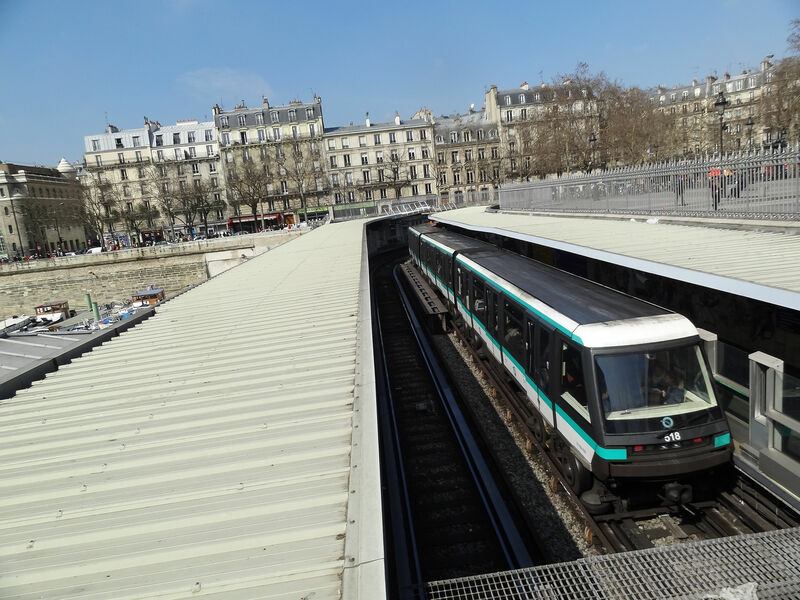 Another MF77 train on the metro line 7 arriving to the Louis Blanc metro station on its way towards Villejuif. 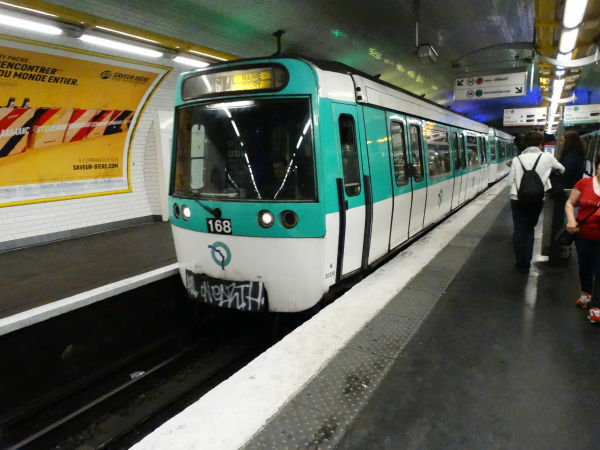 The line 7 is a long steel wheels on steel rails line and on this station there begins a short branch line 7bis, the train of which is shown in the picture below. Picture from Louis Blanc station 5.6.2018 by Ilkka Siissalo. The Paris metro train type MF88 is a steel wheels on steel rails variant, a further development of the model MF77. They were built from 1993 onwards. 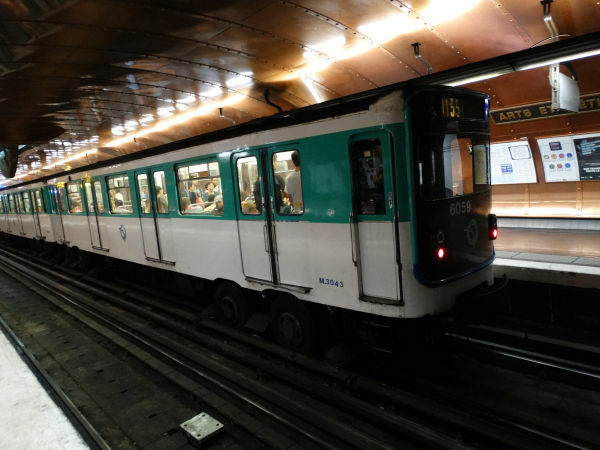 Only nine train sets of this type were built and currently they operate on the line 7bis which is a short branch line of the metro line 7. This model was never a success and the trains have had to be repaired a lot. Key problem is that it doesn't have traditional real bogies, but just one axle instead of a full bogie. This leads to extensive problems of wear in the rails, but also on the train chassis. Picture from the Louis Blanc station 5.6.2018 by Ilkka Siissalo. A rubber tyre metro of the type MP89. They were built by GEC Alsthom and entered service in 1997. 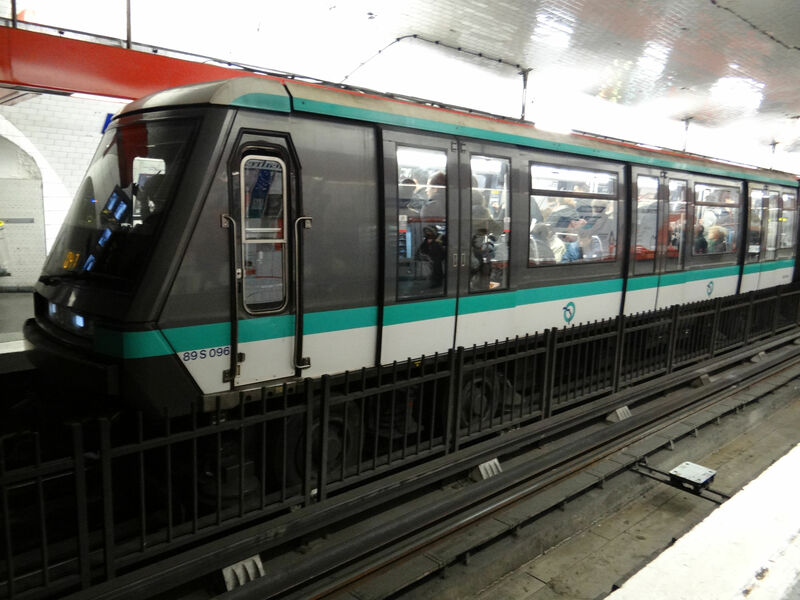 A total of 438 coaches of this type were built, which originally were used so that metro line 1 got 52 new trains and line 14 got 21 trains. The type was developed when there was an urgent need to replace the very first rubber tyre metros of the type MP55. The subtype MP89CA is totally driverless and used on the automated line 14. Picture from the Châtelet station 5.3.2014 by Ilkka Siissalo. 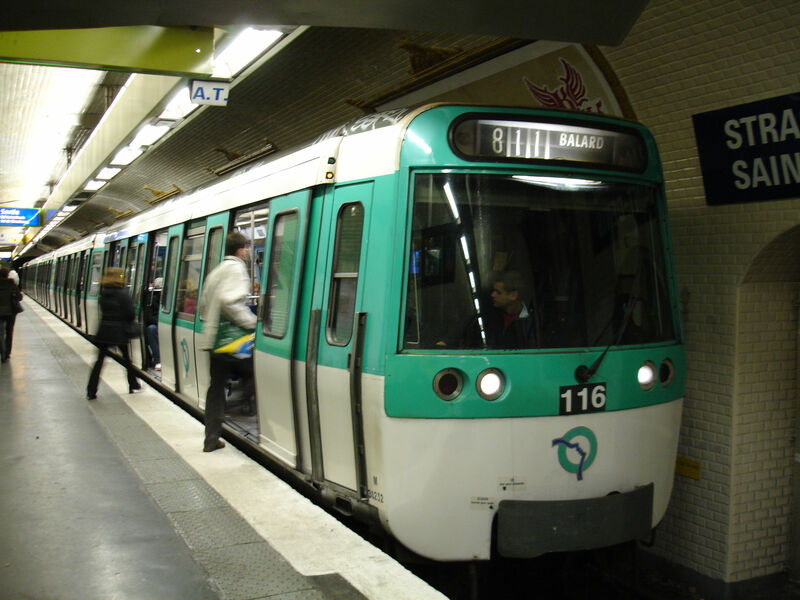 A class MP89CA automated rubber tyre metro stopping at the Bastille station. Picture from Bastille 7.4.2013 by Ilkka Siissalo. 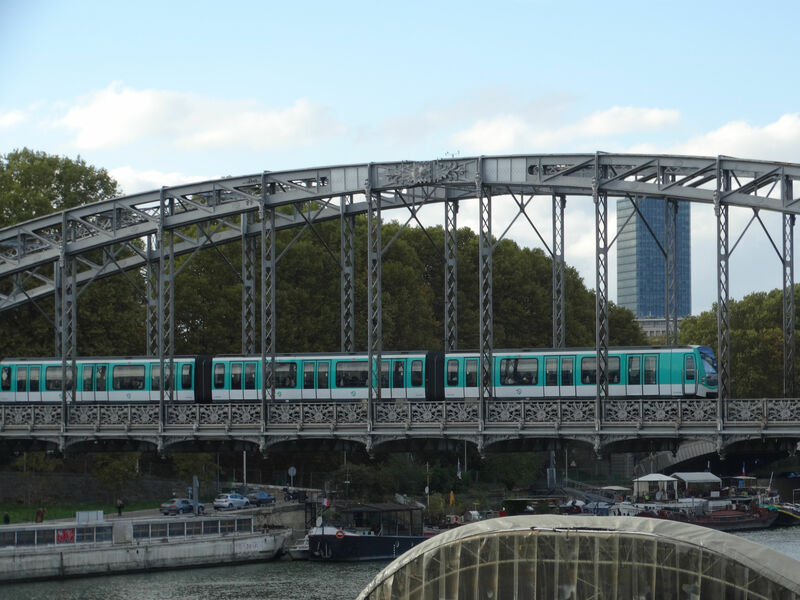 The Paris metro train type MF01 is the newest steel wheels on steel rails type, seen here crossing the river Seine just before arriving at the Quai de la Rapée metro station on line 5. These trains have been taken into service 2007 to 2017. It is a five coach fixed train and it has a driver, so these metros are not totally automated. Picture from Quai de la Rapée station 19.10.2017 by Ilkka Siissalo. Another view of the same train, showing it in full length. The metro system of the city of Rennes is fully automated and has no drivers. There is only one line with 15 stations. 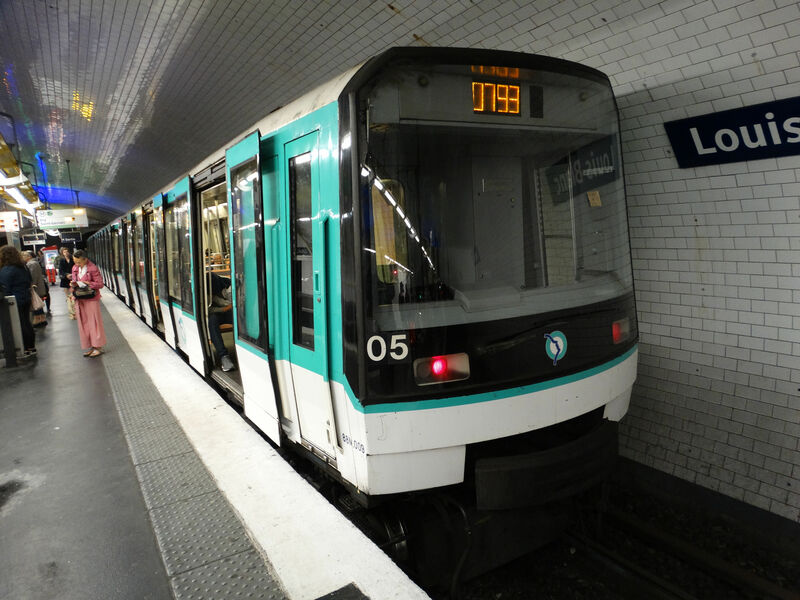 The system is based on the Siemens Transportation Systems VAL (véhicule automatique léger or light automatic vehicle) technology. The only metro line is 9,4 km long. Picture 25.1.2008 by Sanna Siissalo.